Kantar-GeoPoll Media Measurement collects daily data on ratings, audience size and share, and more for TV and radio stations across 8 countries in Africa. This data minimizes the risks brands and agencies make when deciding how to reach their target audiences by giving them accurate, up-to-date data. In Kenya, here are the trends we saw for radio and TV consumption in Q1 2016, from January 1st to March 31st. To subscribe to our full dataset or access custom media data, contact us. Citizen TV continued to dominate ratings in Q1, drawing an average rating of 7.9 compared to 7.5 in Q4 2015. KTN slightly increased its share from Q4 to Q1, from 3.0 to 3.2, and remained in second place, whereas NTV fell in share from 1.9 to 1.8 and remained in third place. 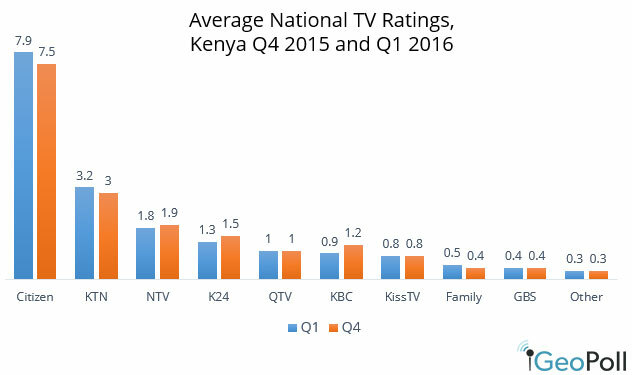 K24 and QTV were forth and fifth in terms of average ratings in Q1. The below chart demonstrates ratings for Q4 2015 and Q1 2016. We find that throughout the week, Citizen remains on top in all time blocks, with KTN second. The only time that NTV surpasses KTN in terms of viewers is from 19:30 to 21:00 on Sundays, which is when the popular Churchill Show airs. We have observed this trend in the past, and the Churchill show continues to bring in NTV’s highest ratings of the week. 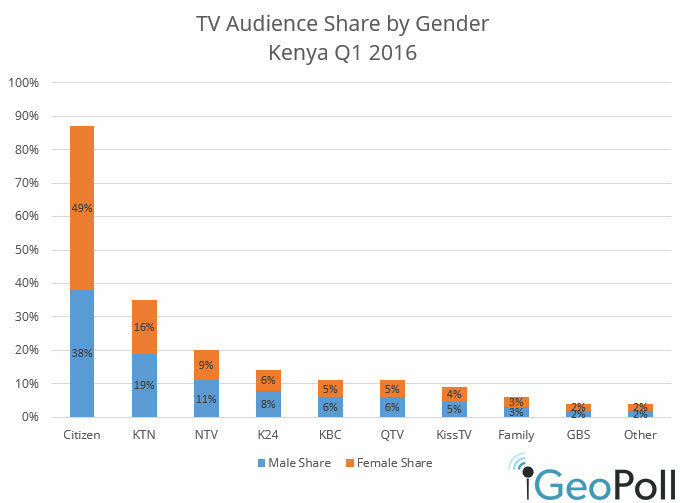 We also examined viewing trends by gender, finding that K24 and Kiss TV have the highest affinity amongst male viewers in Q1, while KBC, Family, GBS, and Inooro TV have the highest affinity among female viewers. Citizen continues to be popular amongst both males and females, with females having a slightly higher affinity for Citizen than males. In Q1, Citizen had 49% of the audience share among female viewers, and 38% of the share amongst male viewers. National listenership share for radio is more spread out than for TV: while Citizen radio had a 21% share in Q1 2016, other stations including Radio Maisha (13%), Jambo (12%) and Classic (8%) draw significant audiences. Due to the large number of smaller and sometimes local radio stations, 21% of the average audience share is listening to an “Other” station, one that does not have a high enough listenership to rank nationally. 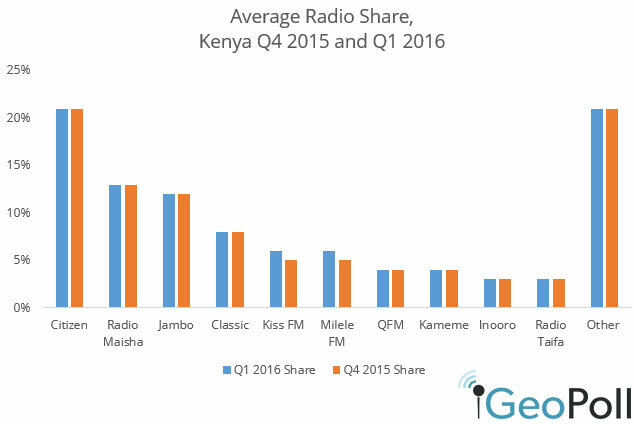 Below is a chart of radio share for Q1 2016 vs Q4 2015. When comparing radio ratings and share by demographics, we find that male listers have a preference for Citizen, Jambo, and Maisha. Females have higher listenership than males for Classic and Kameme. Overall, Kiswahili stations maintain a consistent lead over English-language stations in Q1. We also examined listenership by location. In Central, Citizen leads in listenership, followed by Inooro and Kameme. Classic FM is ranked third in Coast, behind Citizen and Radio Maisha, and Ramogi FM leads in Lake Topography. Star FM leads in North Eastern, followed by KBC English Service. In Upper Eastern, Muuga FM leads over Citizen. These data demonstrate the regional differences in radio listenership and listenership trends across the country. Kantar-Geopoll Media Measurement produces daily data on TV and Radio in Kenya, Ghana, Nigeria, Mozambique, Rwanda, Tanzania, Uganda, and the Democratic Republic of Congo. Data can be segmented by age, gender, and location to ensure media buyers and broadcasters are using the most up-to-date information available to make quick, informed decisions. To find out more and get pricing, contact us below.